Handcrafted Furniture always is intriguing and instills a sense of pride in the owner. Glam up your home with our Exclusive Made to Order range of Premium Dining Furniture. Dining Area is one place where the whole family can share some moments together. And when each piece is made according to your home and blends to your surroundings, you reach a whole new level. Presenting Made-to-Order Dining Furniture. 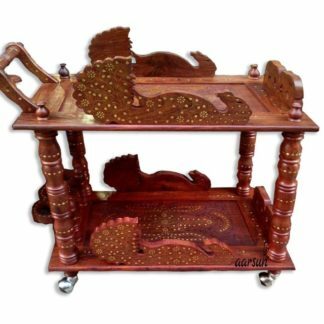 The units are handcrafted by experienced artisans from Saharanpur. Saharanpur is known for its wood-working since Mughal ages and the vintage carving techniques still exists. Each piece is carefully handmade by artisans in traditional vintage designs. The 8 seater Dining Set, Crockery Almirah / Showcase and the Side Cabinet with a Large Mirror Frame and that too polished in Gold Finish is awe-inspiring in quality. The fabric and the designs are all made to order and can be modified as per your need. Call or WhatsApp us at +91-8192999135 / 8266888634 or mail us at support@aarsunwoods.com for details.